View of The Acropolis from the historic center of Athens. Nowhere in the world will you see a better example of classical Greek architecture than at The Acropolis in Athens. It is located at Dionyssiou Areopagitou in Athens. In Greek “Acro” means high and “polis” means “city”. So, “acropolis” means “high city”. In ancient times, Greeks built structures atop mountains to protect themselves against enemies. You will find an “acropolis” in many Greek cities. However, “The Acropolis” (with a capital ‘A’) refers to the Athens site, constructed in the 5th Century BC. The Parthenon was dedicated to the patron goddess of the city of Athens: Athena Parthenos. Generally whenever you look up in Athens, you see the Acropolis. When people think of it, most think of one building: the Parthenon, arguably the most readily recognizable Acropolis structure. Historians say it was dedicated to Athena Parthenos, the patron goddess of the city of Athens. It was constructed between 447 and 438 BC. The Propylaea served as an entryway to the Acropolis. Actually, the Parthenon shares the approximately seven acres of the Acropolis with other structures. For example, The Propylaea is a gateway that serves as the Acropolis entryway. The Erechtheum is a temple on the north side of The Acropolis. which was dedicated to Athena (the virgin Greek goddess of reason, intelligent activity, arts and literature) and Poseidon (the Greek god of the sea and earthquakes). Another remarkable temple on The Acropolis is dedicated to Athena Nike and sits at the site’s southwest corner. The word “Nike” means “victory” in Greek. The goddess Athena was worshiped as the goddess of victory in war and wisdom. 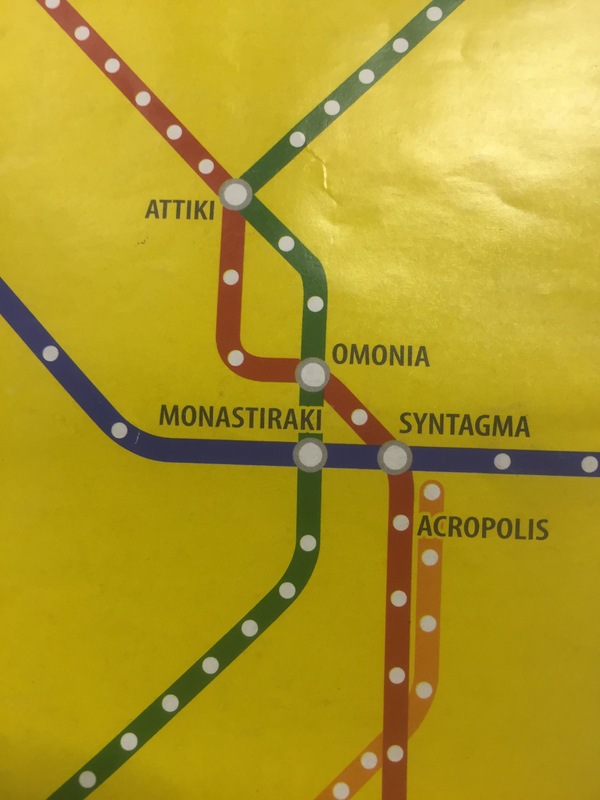 If you want to take the subway to the stop nearest The Acropolis, take the red subway line to the “Acropolis” stop. Upon arriving, you will likely have to wait in line to buy tickets. You should expect to wait at least 30 minutes, especially in the height of tourist season. Entry is 20 Euro per person (as of this writing). The Acropolis remains open from 8AM until 6:30pm from April through October and 8AM to 3pm from November through March. If you go in summer and are fair-skinned or want to avoid sun, wear a wide-brimmed hat or carry an umbrella and go early in the morning when it is not so hot. There are only a few areas for shade. Don’t touch the marble! Be prepared to take pictures and use your imagination to figure out how ancient marble feels! Also, structures that comprise the Acropolis have quite a few in-ground stones around them but no paved areas. Wear shoes with some tread to avoid slipping on smooth stones. If you bring large bags or backpacks, you’ll have to check them into the cloakroom. No trip to Athens would be complete without visiting the Acropolis. Where else can you take a selfie in front of structures built in the 5th Century BC? Mikey B. The Acropolis, July 2017. ← AVRA Restaurant Garden, Mykonos, Greece: The Lowdown!